The Achievement Center’s Community Inclusion program gives students opportunities to explore their community and enjoy many of the activities enjoyed by their non-disabled peers. Students and staff choose activities. We created this service with the intention of broadening the individual’s independent participation in the community. These special needs field trips improve skills necessary for that participation. 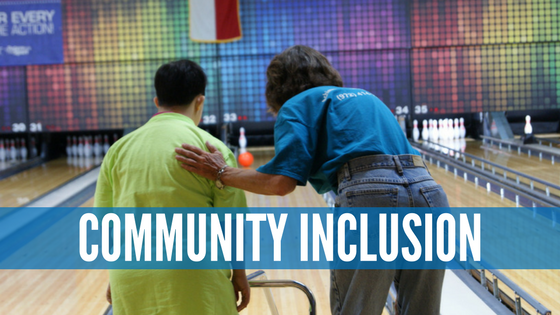 Why Is Community Inclusion Important? Our center is not a place to hide people with special needs away from the public. People with special needs deserve every daily right and privilege that able-minded and able-bodied people receive. We use our outings to not only help our students build self-confidence and acquire new Life Skills, but to also integrate our students into everyday society. We believe that the more non-students come into contact with our students, the more comfortable they will be with them. The more comfortable they are with them, the more likely they are to be seen for their humanity and not their disabilities. These trips are more than just fun outings. They're growing experiences. Where Do Students Go During Community Inclusion? What Do Students Learn During Community Inclusion? Our staff use special needs field trips to the movies as a learning opportunity. For example, students learn how to pick the right movie for everyone in a group and respect majority rules, interact with cashiers. They also learn how to manage small amounts of money when paying for tickets, keep tickets and practice socially acceptable behavior in the theater during the showing. This is just one example! We turn every fun field trip into a learning opportunity.